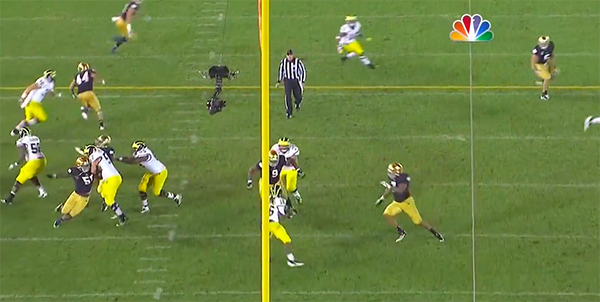 Later in the game, NBC was nice enough to break down all of Denard's massive mistakes, including this interception. Here's a different view (video below). Stand in the pocket. Take the hit. Make the throw. Update: The player identified as Gardner below is actually Jerald Robinson as pointed out by Tim Sullivan in the comments. Confirmation bias and etc. The thrust of the post still applies. That receiver needs to block the blitzing corner. When Michigan played Alabama, the Crimson Tide cornerbacks spent a lot of the game ignoring Michigan's receivers or blitzing off the corner with abandon, so much so that both MGoBlog and myself wrote different posts about the aggressiveness. Alabama is known for blitzing its boundary corners. Notre Dame, to my knowledge, isn't, but did so at least once against Michigan with similar effects. 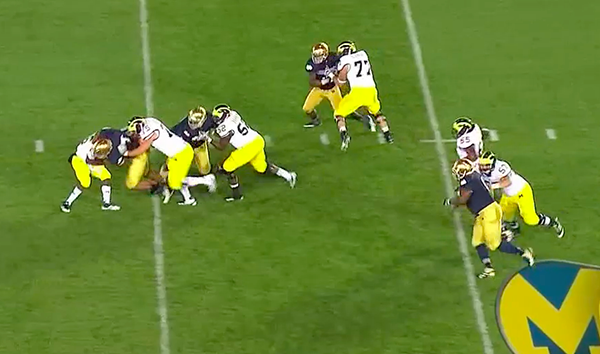 It's first and 10 late in the first quarter and Michigan is in a four-wide, one-back set. Notre Dame comes out in a 4-3 nickel package. 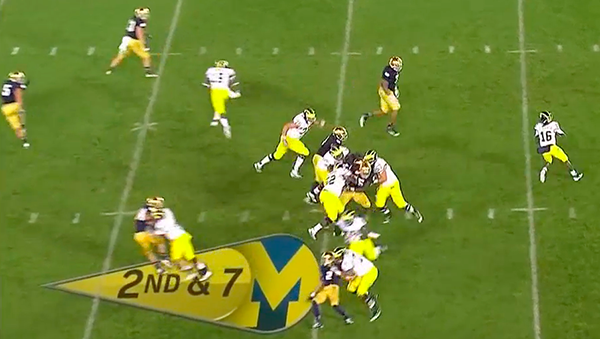 As the ball is snapped, the boundary corner (bottom of the screen; covering Devin Gardner, more about this later) immediately blitzes. 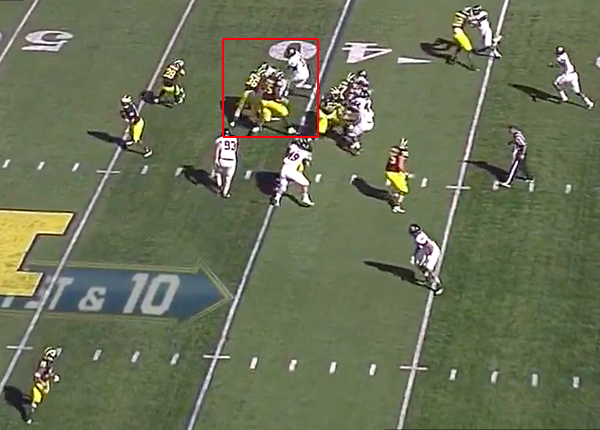 Denard is reading the strongside defensive end (highlighted) and hasn't seen the corner coming on a blitz. 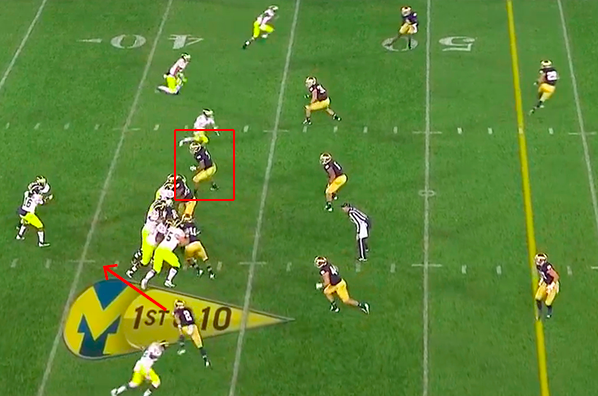 The defensive end stays high, forcing Denard to hand the ball off, right into the blitz. Elliott Mealer is also getting put on skates and rolled into the backfield. Fitz Toussaint is wrapped up in the backfield by the blitzing corner. Mealer's inability to hold up here probably stops Toussaint from making any moves on the corner in the backfield, but I don't think it would have changed the end result much. Defenses are not worried about blitzing corners because Michigan never calls audibles/checks at the line, so showing the blitz before the snap is not a concern. 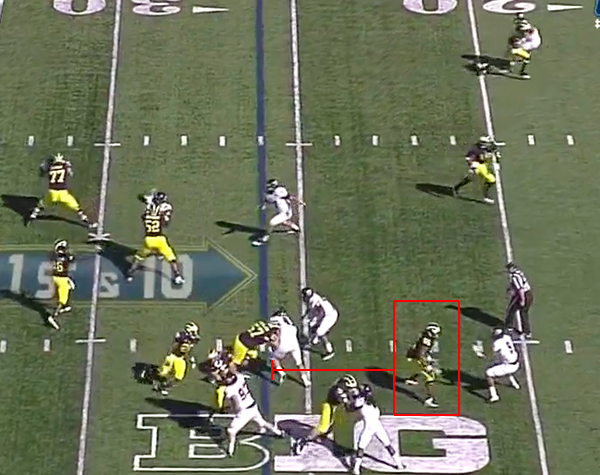 More importantly, no one is worried about Gardner as a receiver or Denard as a passer. Corner blitzes against most teams result in good matchups for the offense and easy completions. Against Michigan, you can gamble by putting your safety on a wide receiver because Michigan's wide outs can't get separation. 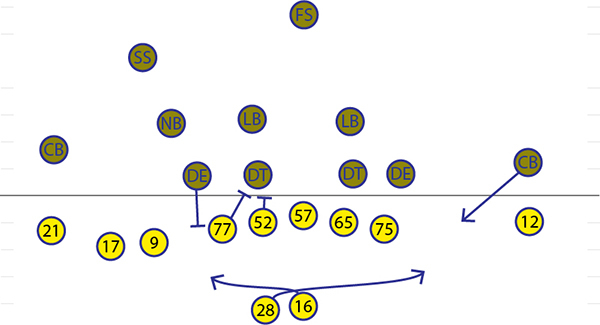 More commonly this year, michigan has run the inverted veer zone read (below), which leaves the playside DE unblocked. That play is designed to get the running back outside or the QB running vertically. A corner blitz with the same principles (DE staying home on the QB and a corner blitz from the side opposite the RB) produces the same result. As long as the defensive end is instructed to play the QB on this zone read, the blitzing corner will always have a free shot at a running back in the backfield. So corner blitzes are bad for the zone read. This doesn't surprise anyone. 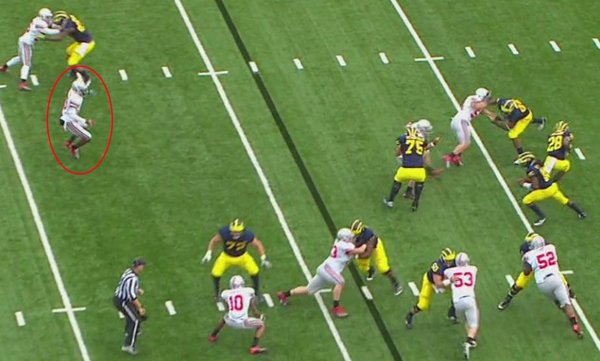 But I can't see any way that Gardner is not supposed to at least try and block the blitzer. That's his assignment before the play begins and should be his assignment even if the player decides to blitz. If he can't make the block but attempts to, fine. That's just another blown blocking assignment; we've seen plenty of those this year. But his refusal to even try is what's bothersome here. The real problem is, Borges doesn't seem to have a fix for this and without game-breaking wide receivers or a consistent QB, this is an effective way for teams to force Denard to throw the ball. 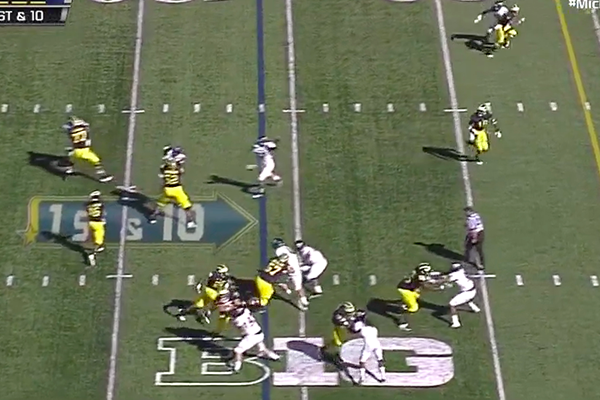 You can put a fullback in the backfield on Denard's right, but this is twice now that we've seen Gardner completely ignore what should be his blocking assignment because of a blitz. After the Alabama game, there was panic everywhere--mostly here--about Michael Schofield at right tackle. After two games against mediocre-to-terrible competition, it seemed like the offensive line was starting to gel a little more, but Schofield still seemed like a liability. Against Notre Dame, that was confirmed. It's early in the first quarter on third and goal from the 15 yard line. Notre Dame has three down linemen shaded to the strongside of the field and are in a nickel package. 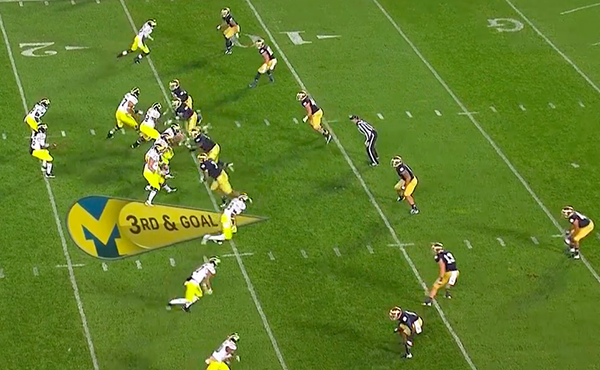 As the ball is snapped, Notre Dame rushes the four players on the line of scrimmage. A moment later, the offensive line engages the rushers. It is a little hard to see here, but Notre Dame defensive end Stephon Tuitt gets his hands inside of Schofield (highlighted). ... and Schofield can't even take a penalty to stop Tuitt from getting the sack, though he tries his best. Down goes Denard with Schofield running behind his assignment. I'm already tired of watching Schofield staring down at Denard after a sack. You can make excuses for the level of competition--Tuitt already has six sacks this season--but Schofield's inability to hold up against top-level competition is a huge problem. On this play, he was matched up one-on-one with a defensive end who simply ran through him. If he doesn't possess the speed to pass protect against speed rushers and gets blown off the line against bull rushes, teams will continue to attack him throughout the season. This is going to be a major point of concern all year. 2012 was always going to be about Denard. For the last two years, Michigan has lived and died by his ability to break 86-yard touchdown runs or make the catastrophic mistake. In 2010, Rich Rodriguez redefined Michigan with a 6'0", 4-star "athlete" from Deerfield Beach, Florida, who led arguably the greatest offense Michigan has ever seen. Unfortunately, Rodriguez failed to understand that football was more than just scoring points, and as the defense and recruiting deteriorated, so did the program. Rodriguez was gone but regardless of who came to Michigan, they were going to live and die by the hand--and feet--of Denard. Last year, while Al Borges fumbled to figure out what to do with Denard, the team stumbled to a surprising 11-2 record, but Borges quickly figured out what everyone else already knew: if Denard was on his game, Michigan had a chance to beat anyone. 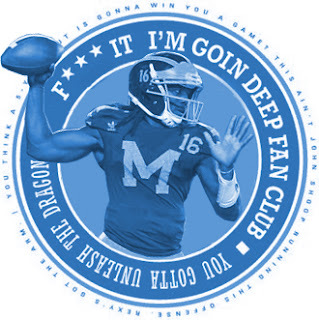 Unfortunately, as the season wore on, Denard's limitations in the new system became apparent: there weren't enough receivers spreading the field, complicating Denard's reads; he threw panicked jump balls off his back foot that were miraculously reeled in by breakout star Junior Hemingway; and his overall accuracy was still nowhere near elite levels. Now, Hemingway is gone, Michigan's conference-best offensive line has been Swiss Cheesed by graduation, and Denard, despite being a senior in his second year of the system, has proven that he plateaued--two years ago. Saturday's game against Notre Dame was more frustrating than surprising, but it was a stark reminder of exactly what this team's limitations and weaknesses are. Given the proper system and personnel, Denard Robinson can be a great quarterback, but without that precise set of circumstances, Denard will never be better than the erratic, mechanic-flawed quarterback he was when he first took over under Rodriguez's direction. Denard's ceiling remains one of the highest of any player in the entire country, but the reason he'll never be an elite quarterback is because of how effortlessly he plunges to his basement. Saturday epitomized everything that is wrong with this iteration of Michigan's team. Notre Dame was able to rush three and four linemen and still get pressure on Denard because the offensive line struggles in pass protection. Denard failed to read the flooded defensive zones and stared down his receivers, allowing the Irish defenders to jump the passing lanes. And the secondary, though it is coping with injures, was shredded by the mediocre passing attack of Tommy Rees (8/11 for 115 yards). The silver lining: Michigan's defensive line looked improved over its previous performances, and the Big Ten is still so bad that Michigan may be able to challenge for the league title. But Michigan fans have been able to find a silver lining in every loss over the last two years: the defense can only get better or Denard can't throw four interceptions again or if Michigan had a decent kicker, they would have won. Eventually, those "if"s need to turn into wins, but with a team that caters to high variance, it feels like the silver lining will be the real story of 2012. 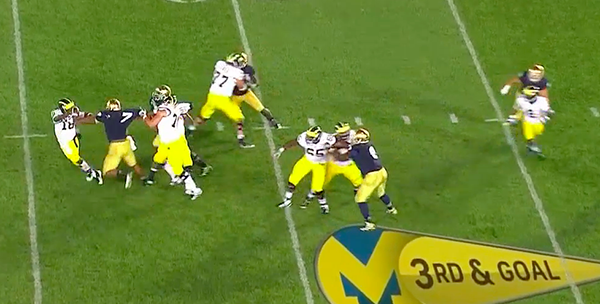 The concept that "Denard is most dangerous when he stands in the pocket" has to be bunk by this point. The problem with Denard sitting in the pocket (and this may be more a problem with the scheme) is that he's not waiting for a receiver to cut across the field through a hole in the defense. 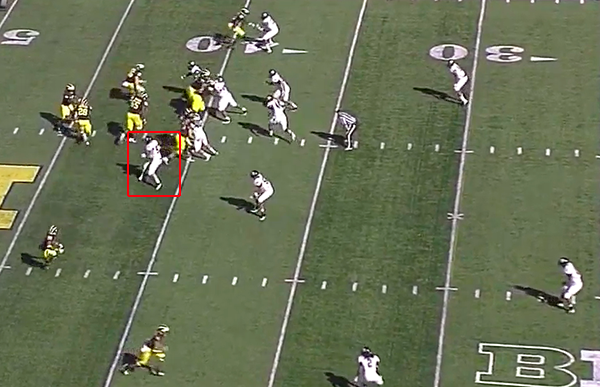 He's waiting for a receiver to run far enough downfield that he feels confident heaving it into single coverage. 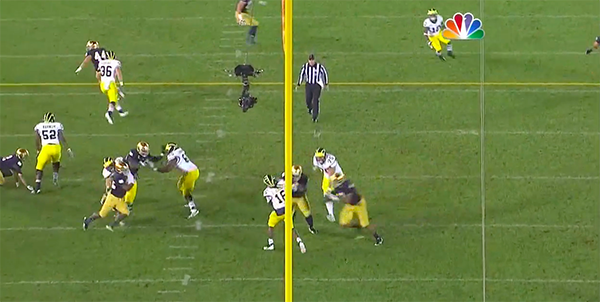 When's the last time Denard stood in the pocket and threw a pass over the middle to a crossing receiver? 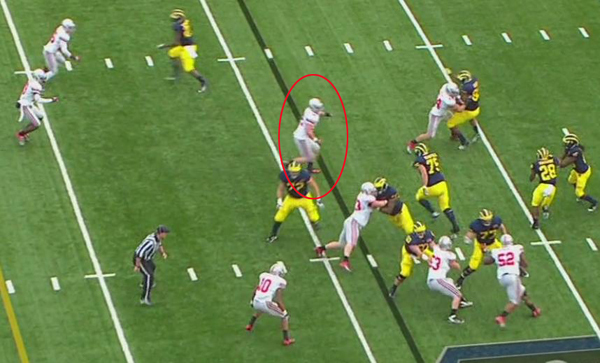 Hitting Odoms last year across the middle on fourth down against Nebraska (Ohio State?)? Silver lining: Despite turning the ball over 6 times in the game, Michigan's defense only allowed 13 points. That's an impressive turnout for any defense, but especially for one with so many question marks. Will Campbell and Quinton Washington looked great slicing into the backfield on slants but they were always just one step too slow to make a tackle for loss. I recently lived in Los Angeles and when Al Borges was announced as the offensive coordinator for Michigan, everyone told me the same thing: He's a really great OC but he often gets too smart for himself. The Vincent Smith interception was Borges getting too smart for himself. Play action, naked bootlegs are not working. They didn't work last year. They're not working this year. For the exact same reasons: the backside defenders are not committing to the run, instead playing contain on Denard and disregarding the handoff. 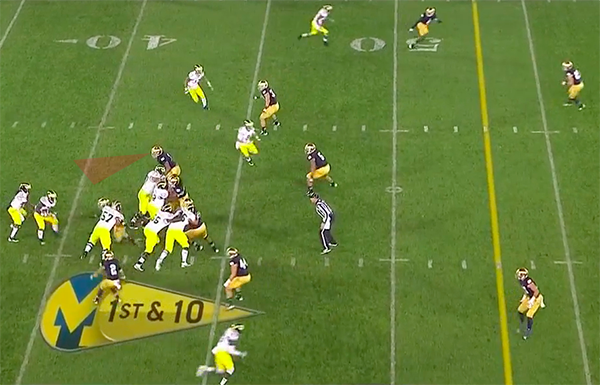 JT Floyd being unable to jam a tight end split outside on the final drive of the game is a very JT Floyd thing to do. That was... distressing. He struggled all game. Raymon Taylor's interception was perfect. That's how you're supposed to play zone defense. Fitz Toussaint's pass blocking is terrible. This is an aside and I won't go on about it too long because that's not really my thing, but John Bacon's Detroit News article "Some Michigan fans can't appreciate brilliance of Denard Robinson" pissed me off when it was published. It's the kind of condescending article that assumes ignorance from the same people who are supposed to be reading his columns. It's pandering and passive aggressive and I wish Bacon treated his readers with more respect. Sure, Denard is a great talent, but pointing out obvious errors in his play is not some masochistic practice that Michigan fans take part in because they like being upset about things. This Notre Dame game happened and Denard's performance didn't surprise anyone who questioned his abilities as a passer. Michigan gets a bye next week before starting the Big Ten schedule against Purdue. This is as good a time as any to lick your wounds, reevaluate schemes, and get healthy. Posting next week might be slow (grad school beckons and a week off from blogging might allow me to get a jump on work due later in the semester). This week will be painful as I rewatch this game and break down a whole bunch of the game. #20 Notre Dame 20 - #10 Michigan State 3. Last week, Notre Dame proved what I've been telling people since the season began: Michigan State ain't that good. Le'Veon Bell averaged 4.1 YPC on 19 totes, which is actually a pretty good turnout for him (minus the one or two 60-yard runs he's been breaking off against weak competition). And Andrew Maxwell earned himself the Captain Checkdown Of The Week award with 187 yards on 23/45 passing (4.2 YPA). Though, MSU's shoddy offensive line did no Spartans any favors. Notre Dame, played well, but their greatest achievement was getting everyone who votes in the polls to overrate them again. QB Everett Golson had a fairly lackluster day (14/32, 178 yards, 1TD). Bowling ball Cierre Wood--fresh off his two-game suspension--acquitted himself well with 56 yards on 10 carries. But this game was a defensive struggle: only 537 yards of combined total offense, a combined 6-31 on third down, and 16 punts. UMass 13 - #17 Michigan 63. Denard's career stats versus Notre Dame: 35/64 through the air for 582 yards, 5 TDs, 3 INTs, and 48 carries for 387 yards (3 TDs). Though Michigan fans all have fond memories of Denard taking on the Irish, in a dozen alternate universes, people have a much different sentiment regarding the lace-less one and the Domers. This has not escaped Hoke and the rest of the coaching staff who have mentioned a few times this week that last year's game didn't go as planned until the final quarter of the game. 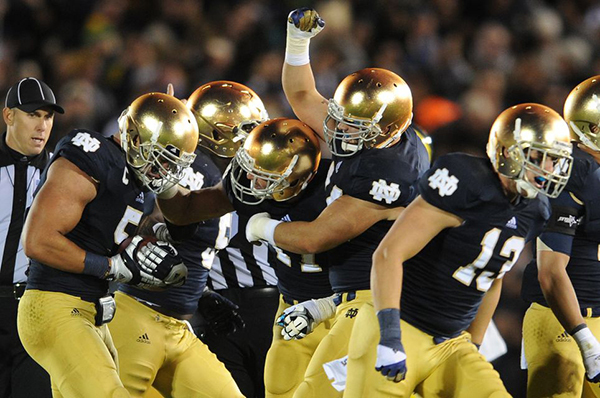 The name everyone remembers on Notre Dame's defense is linebacker Manti Te'o. His superstar has only been diminished by a fairly lackluster group surrounding him to date. Otherwise, Te'o has lived up to all the hype. 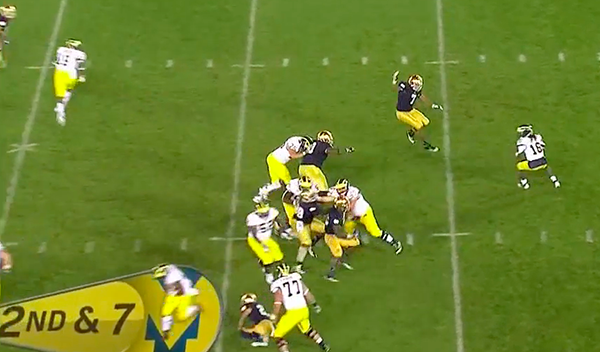 Running through the middle of the field against Notre Dame is a harrowing affair with Te'o roaming around. Whether or not he'll be able to make the shoestring tackles that Nebraska's Levonte David did against Denard last year will go a long way to determining how this game plays out. The other problem running the ball against Notre Dame is its intimidating defensive line, led by nose tackle Louis Nix III. The Fighting Irish have had three games against mediocre-to-good rushing teams (Navy, Purdue, MSU) and still rank 23rd in the NCAA in rushing yards allowed per game. 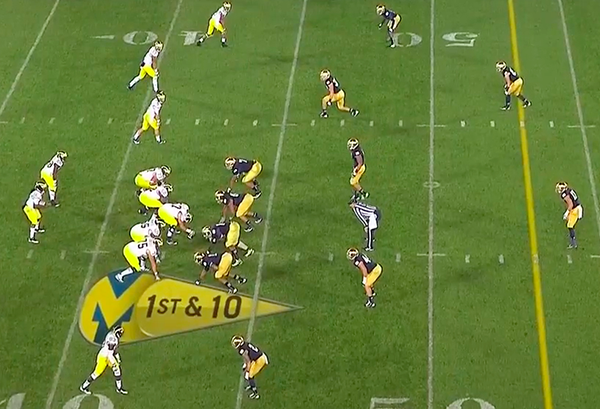 The weakness in Notre Dame's defense is a secondary that looks like Michigan's in 2010. To date, ND has lost safety Jamorris Slaughter, safety Austin Collinsworth, and starting cornerback Lo Wood to season-ending injuries. Despite these injuries, Notre Dame's passing rank is still high: 38th nationally in passing yards allowed per game and and 26th nationally in pass efficiency defense. However, the Fighting Irish have played Navy (an option team that never throws the ball), Captain Checkdown, and Purdue. They haven't really been tested this season. The matchups to watch will be whether or not Te'o can adequately cover Devin Funchess on seam and wheel routes downfield and whether or not anyone in the ND secondary can cover Devin Gardner. 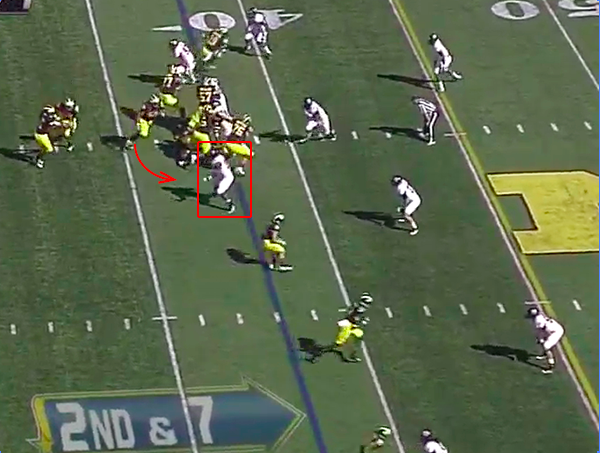 The other potential turning point--and Michigan fans are used to watching for things like this already--will be whether or not an inexperienced secondary can maintain proper outside leverage and not let Denard/Fitz Toussaint get to the edge. With Borges utilizing bubble screens this year, testing young safeties in open space may be a way to gain easy yardage throughout the game. On paper, Notre Dame's offense is not very intimidating: 67th in rushing offense, 67th in passing offense, 74th at pass efficiency, and 61st in scoring offense. However, they also have Cierre Wood (pictured above). Last year, Wood racked up 134 yards on just 25 carries (5.4 YPC) against Michigan, and that was with NFL talents like Mike Martin and Ryan Van Bergen manning the defensive line. Now? Yeesh. Wood is fast and tough to bring down, and with a suspect defensive line and young/mediocre linebackers, this game will show just how good (or bad, as the case may be) Michigan's defense will be this year. The passing defense is less harrowing. Sophomore quarterback Everett Golson is completing 58% of his passes this season, and has only 3 touchdown passes (1 INT). 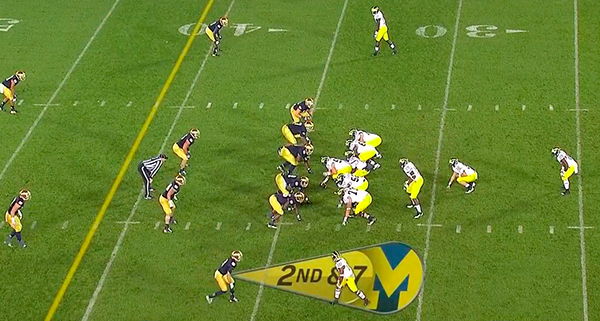 Michigan's secondary is equipped to defend whatever Golson can bring. 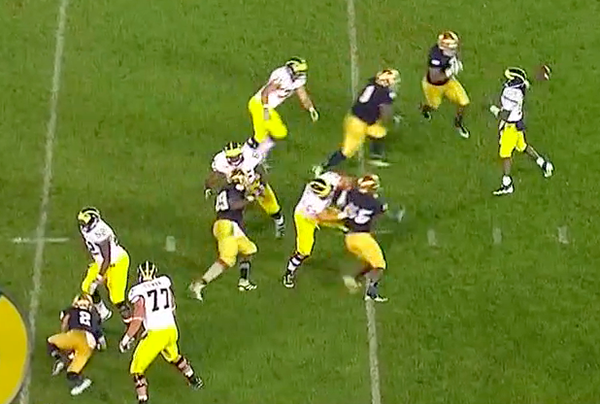 Expect Greg Mattison to send a lot of blitzes his way to try and hurry the young quarterback into bad throws. 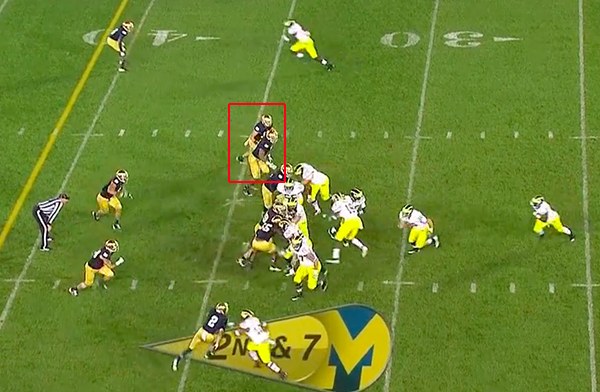 When plays do break down, Golson has some scrambling ability, but not enough to really scare the Michigan defense. He'll probably pick up a few frustrating first downs on third and long, but if Michigan can limit those conversions, they should be able to make the Irish offense stall out. The team's leading receiver is senior tight end Tyler Eifert, who will present some problems for Michigan. Guarding him will come down to Jordan Kovacs or various linebackers staying disciplined on play action and adequately covering him downfield. Otherwise, Notre Dame doesn't have many truly threatening wide receivers, the first time in what seems like a decade. How does Michigan win? Defy previous performances. Michigan performances to date are not going to win this game. The defensive line needs to significantly outperform their turnout to date. It's not necessary to get a ton of pass rush from the interior (not going to happen anyway) or tear through the offensive line for tackles for loss, but they need to hold up against Notre Dame's talented offensive line and allow the linebackers adequate time to hit the proper holes and make tackles. 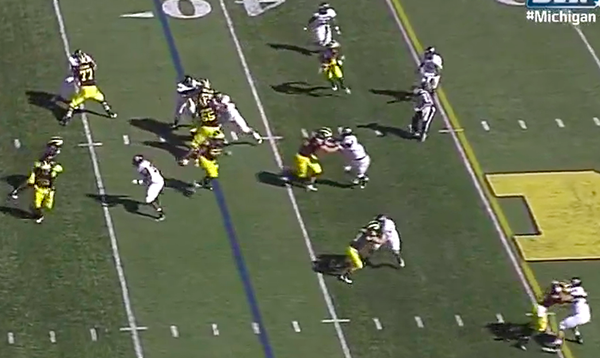 Speaking of tackles, the Wolverine defenders need to do a better job of wrapping up the ball carrier. 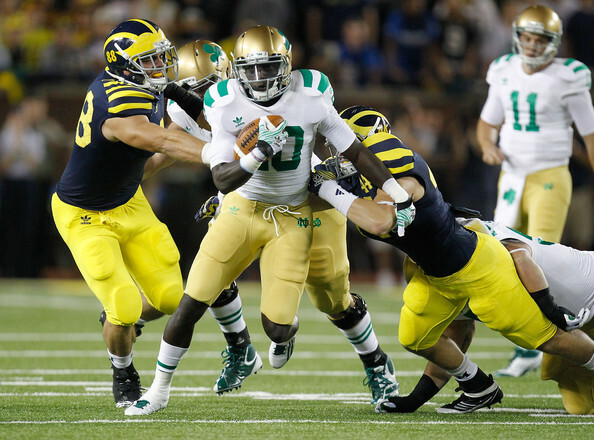 Offensively, Denard needs to play like 2011 Notre Dame 4th Quarter Denard for the entire game. Luckily Denard probably has the most-complete set of offensive weapons that he's ever had. Funchess and Gardner are players that will need to beat up a bruised Notre Dame secondary. If the offensive line can hold up on running plays, that will open up the passing game for Denard and his receivers. How does Notre Dame win? If all of this season's evidence is more prescient than Michigan fans hope. Notre Dame should win this game: it's at home, their resume is far superior to Michigan's, and they have more pure talent on both sides of the ball (probably; offense is a toss-up). The Fighting Irish can help themselves by forcing multiple turnovers from Denard, and if they're able to annihilate the Michigan offensive line the way the rest of their opponents have, it's going to be a long day for the Michigan offense. The other think to watch, which isn't pertinent to the play, is Jeremy Gallon at the bottom of the screen, who bends out for a screen pass that isn't thrown. Michigan showed this motion a lot in the first two weeks but only threw the screen twice (both against Alabama, both for 8-yard gains). The Air Force defenders don't look at Gallon on this play, despite him waiting in the flat with a blocker in front of him. My hope is that eventually, this becomes a read for Denard and isn't just smoke and mirrors. If Borges is trying to use this formation/motion to draw defenders and keep the defense honest, opposing defenses actually have to react to it or Michigan will be wasting blockers who could be downfield. 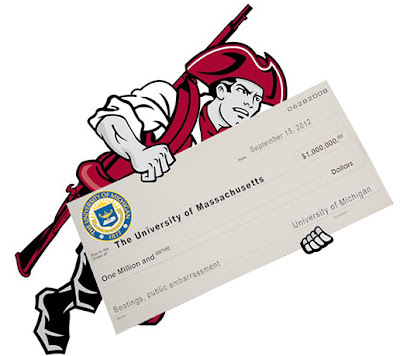 This is more or less spot on, but let's take an example of what Michigan was doing throughout the UMass game. It's early in the first quarter still and Michigan comes out with a 3-WR, two-back shotgun set. UMass is is a base 4-3 defensive look. 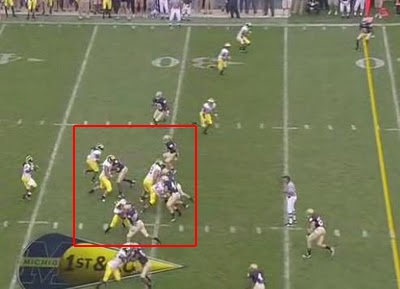 As the ball is snapped, the strongside defensive end (highlighted) is left unblocked. Denard will read him on this play. Notice also: right guard Patrick Omameh will begin to pull across the formation and Jeremy Gallon will begin to bow out for a bubble screen in the slot. Because the defensive end stays high, Denard is forced to hand the ball off to Toussaint despite OMGLAG! 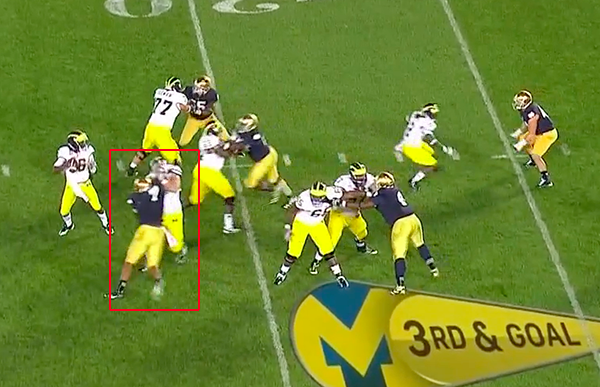 Michigan's blocking gets messed up on the playside (highlighted). Omameh comes inside the formation looking for a block when he should have bounced outside to block the free defender. Omameh (highlighted) is now blocking no one and Toussaint is forced to cut back inside where UMass' backside defenders are collapsing. The closest defender to Gallon is a linebacker who Gallon will run away from. The only other unblocked guy between Gallon and the endzone is a safety that's playing 13 yards off the line of scrimmage. 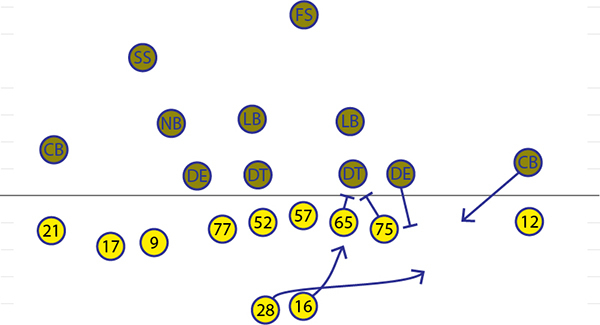 I know that Borges probably won't ever install pre-snap checks, but it's plays like this that are infuriating. Rather than a one-yard loss, UMass is gifting Michigan at least 8 yards here and possibly a touchdown if Gallon can make one player miss in space. Packaging plays. I like that Borges is packaging plays here. The problem with this and similar packages however, is that the offense is optioning a defender who will most likely force the ball out of Denard's hands. Teams would rather see anyone other than Denard carrying the ball, so they instruct their defensive ends to force the handoff. It's possible that whenever a defensive end fails to force the handoff, the remaining defenders will overreact to Denard carrying the ball who can dump it into the flat for the screen. As for whether or not this is actually a packaged play, I think it is. 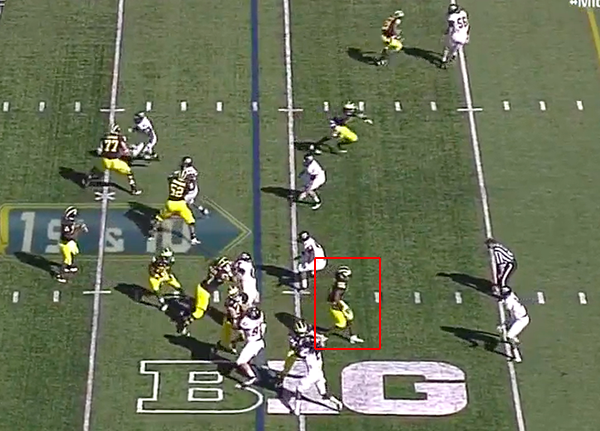 After Denard hands the ball off, he turns and fakes the bubble screen to Gallon. On traditional read option plays, when the QB hands the ball off, he often runs upfield to complete the fake and draw more defenders. It will be interesting to see how these packaged concepts develop throughout the year, but it's nice to see them starting now. Another fun trick that Al Borges brought back from the Rodriguez regime is the ever-deadly QB Oh Noes. 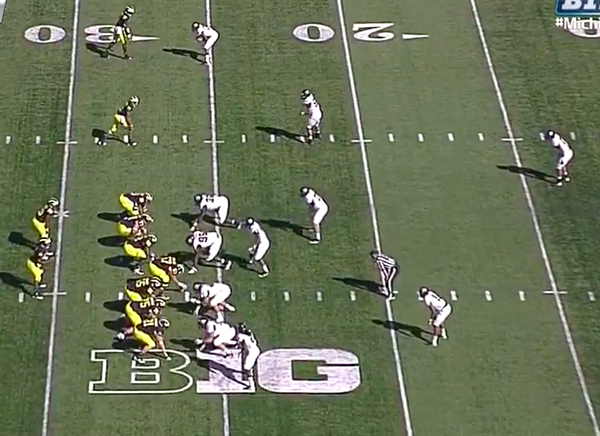 Denard and Roy Roundtree rode this play to become one of the most dynamic QB-WR duos in the Big Ten in 2010. Once this was excised from the playbook, Roundtree's numbers fell off a cliff. So did Denard's, for what it's worth. 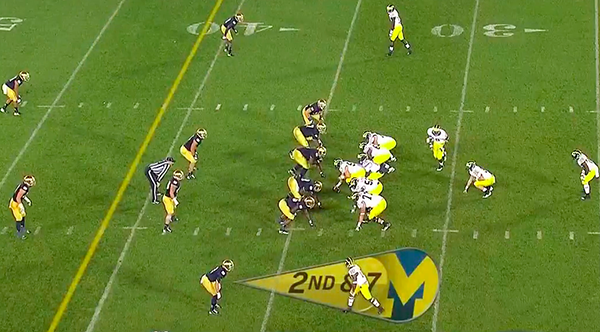 It's the first drive of the game and Michigan coems out in a two-TE set with two receivers split out to Denard's left. 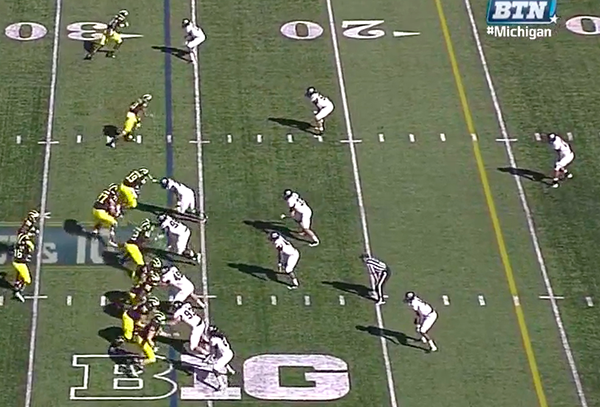 Fitz Toussaint is lined up in the backfield next to Denard. 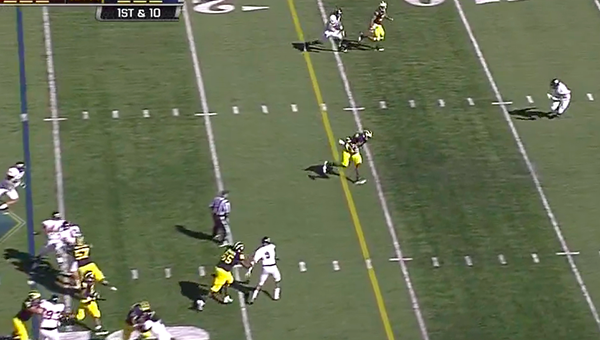 As the ball is snapped, Michigan's two receivers as well as Devin Funchess (TE on the top of the screen) release. Denard immediately looks out to the nickelback lined up over Michigan's slot receiver. Toussaint will come across Denard's face for a handoff. 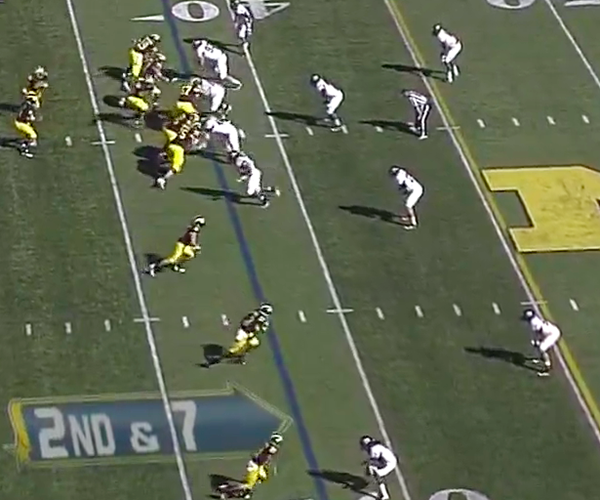 At this point, Denard sees what he wants: UMass' secondary hasn't moved and more importantly, the linebackers are staring into the backfield and ignoring Devin Funchess (arrow) who has a clear lane through the center of the field. 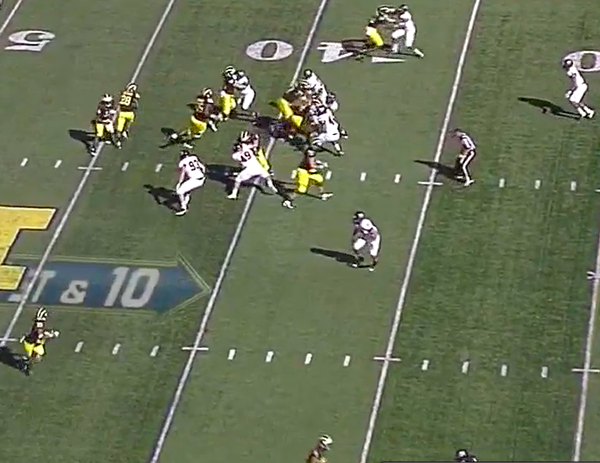 Denard is pulling back to throw to Funchess who is wide open. There's only one problem: Patrick Omameh (highlighted) who is an ineligible receiver, is already two yards beyond the line of scrimmage. This, as you might already know, is a penalty. 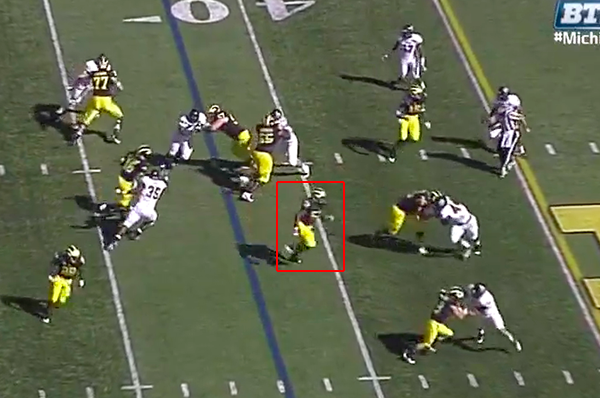 As Denard lets go of the ball, Omameh is already four yards downfield run blocking. This is still illegal. The line of scrimmage here is the 31 yard line. 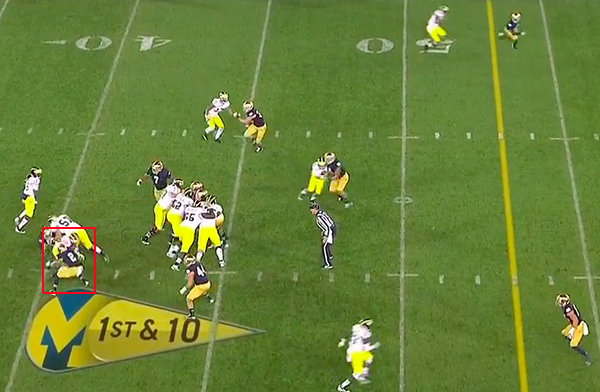 The furthest any of Michigan's linemen get upfield before the throw is the 30 yard line. That's a tough call for the refs to make. Omameh scampering downfield is not. The positive sign from this play, however, is that Borges appears to be learning how to use the threat of Denard's legs as a way to set up easy completions. 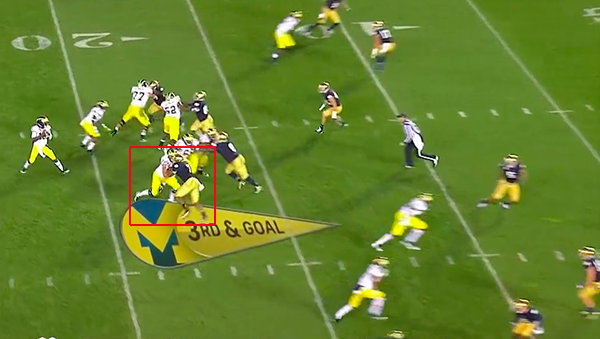 The one tweak here is the use of Devin Funchess to catch the seam route rather than a slot receiver. One of the concerns with this personnel is that if Funchess can't develop into a reliable run-blocker, defenses will start keying in on him as a receiver and disregard the play action. But that's a worry for another time. 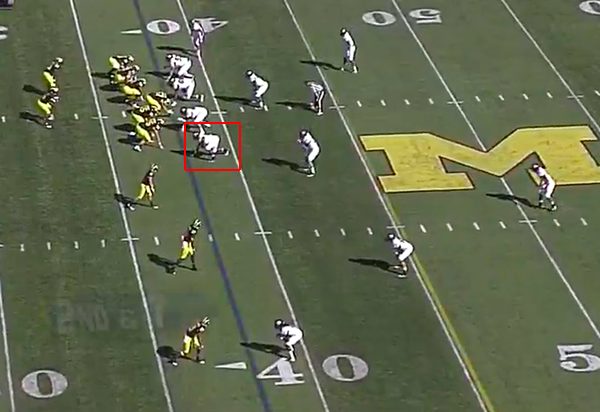 Right now, Funchess is a problem for just about every defense and it's nice to see Borges utilizing his skillset. One of the most frustrating aspects of Michigan's running game since Brady Hoke arrived has been the non-option option. 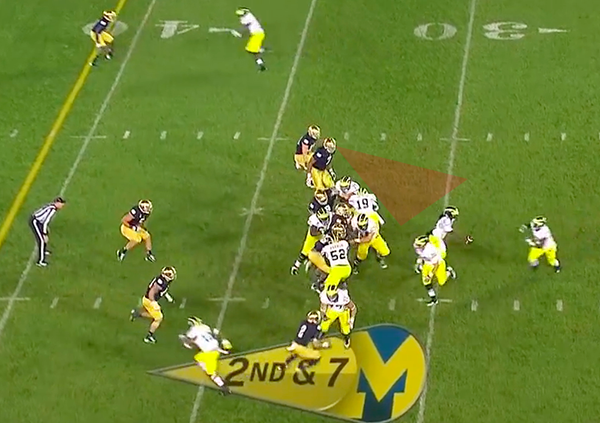 Hoke's tendency to run power schemes with a pulling lineman and helmet-on-helmet blocking has led to Denard running read option plays where no defender is actually optioned. 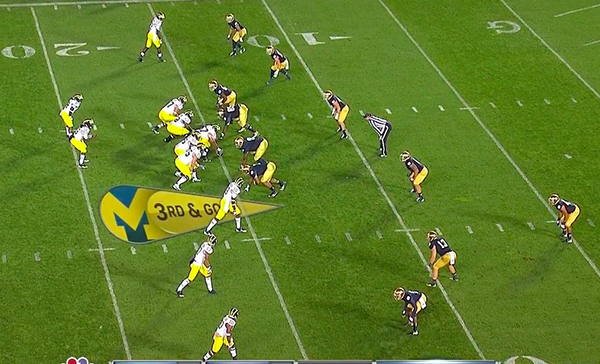 One of the things I noticed immediately against UMass was that Michigan was actually optioning defenders again. It is early in Michigan's first drive of the game. Here, they will run an inverted veer option. This play is intended to get Denard running vertically, or the running back horizontally depending on how it's defended. 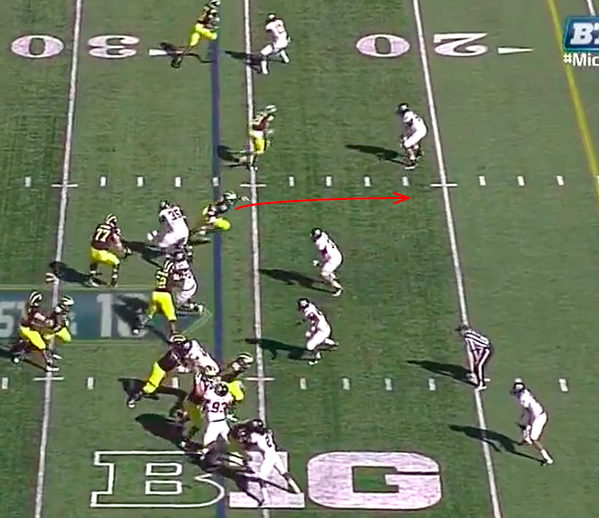 Denard will read the weakside defensive end (highlighted). As the ball is snapped, Michael Schofield and Patrick Omameh double team the weakside defensive tackle. The weakside defensive end was left unblocked. 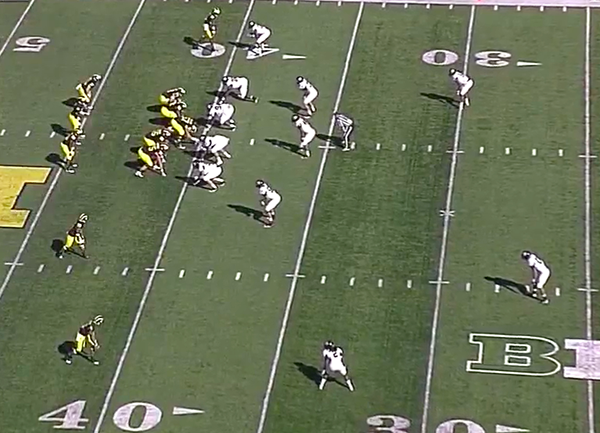 Notice also that Michigan's left guard Ricky Barnum is pulling across the formation to the weakside. 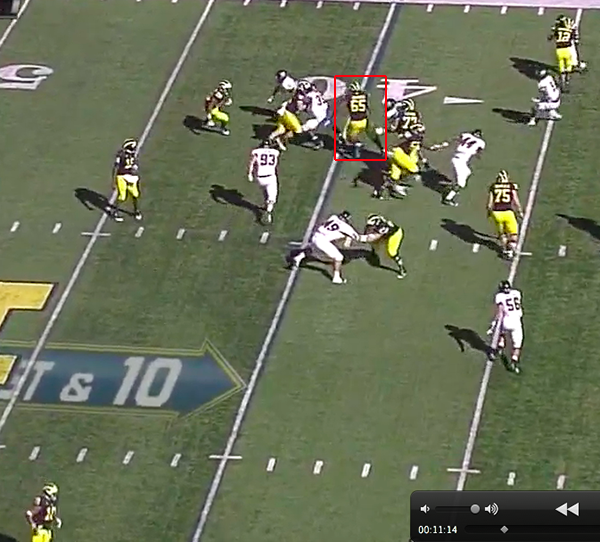 Denard is now reading the weakside defensive end (highlighted). Barnum (arrow) is pulling across the formation. Last year, Michigan used this play a lot against Ohio State, but the pulling guard would often engage the unblocked defensive end (more about this later). In this instance, he runs by him to get to the second level. Denard continues to read the defensive end. Barnum continues to the second level. The defensive end gets too far upfield (probably; you'll see Denard just barely slips by him) so Denard pulls the ball and begins running upfield. 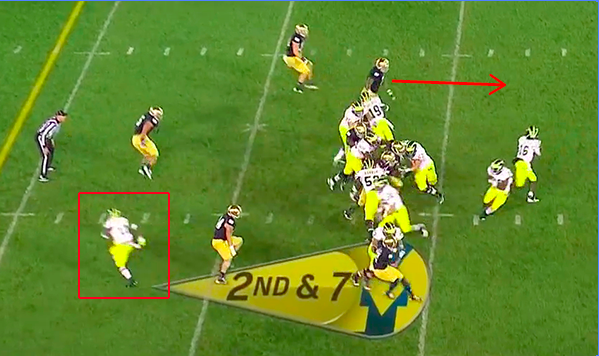 Denard is running by the weakside defensive end. 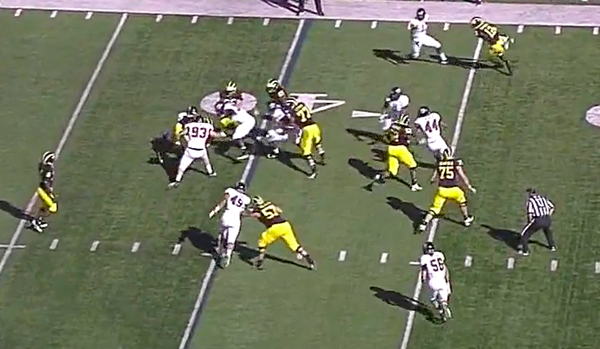 Barnum (highlighted) is looking for someone to block downfield. He'll eventually block the man in front of him that Michael Schofield is currently engaged with. 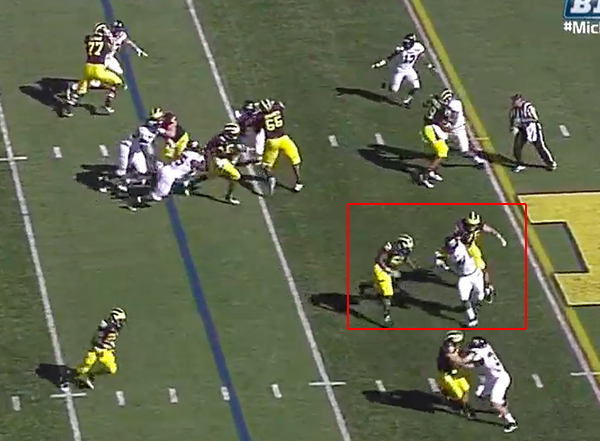 Denard just barely sneaks by the defensive end. 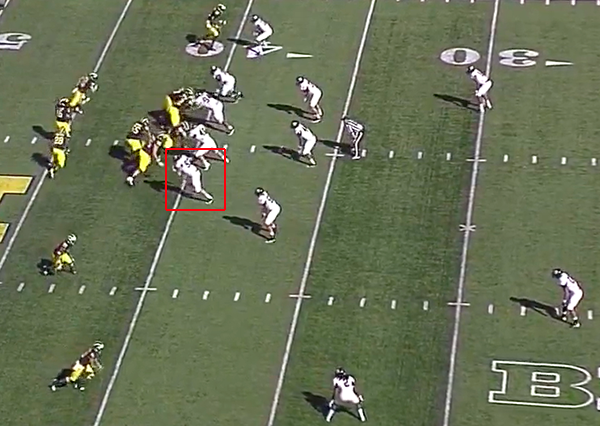 Schofield is losing his block (highlighted), and Barnum is moving to double downfield. Despite Schofield being unable to maintain his block any longer, it probably doesn't matter on this play. It would have been more beneficial if Barnum got downfield and blocked one of the UMass safeties. 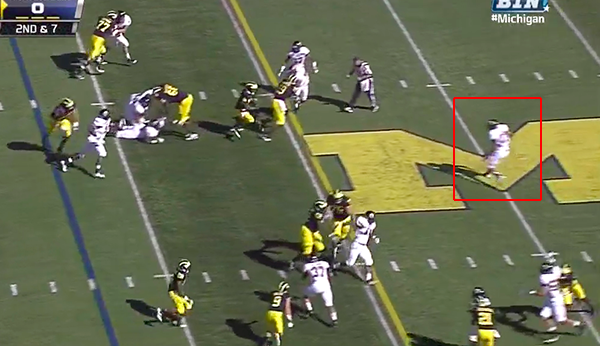 Since Barnum didn't get to a free defender upfield, the UMass safety (highlighted) is left unblocked and able to eventually make the tackle on Denard. 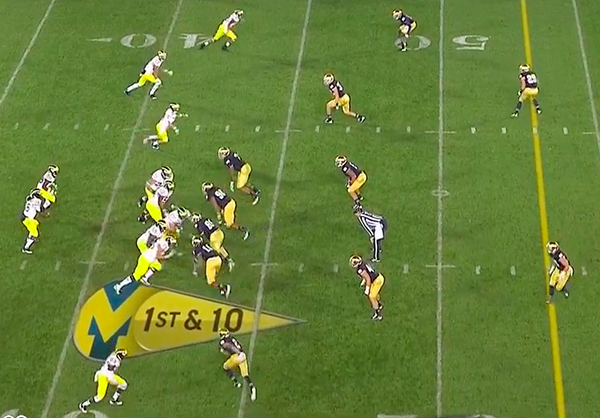 The way Michigan ran this play last year wasn't really an option at all. If you're blocking the player that you're supposed to be optioning, your QB is just taking longer to hand the ball off/run. This schematic tweak against UMass hopefully signals a change in philosophy where the offense will block defenders by optioning them. This seems like a repetition issue. Neither Omameh or Schofield have practiced this blocking scheme as much as they probably should, and pulling across the formation and finding the right defender to block is probably one of those things that just takes getting used to. That said ARGHHH. Block the right guy. I wonder what goes through Denard's mind during a play like this. "Yes, yes, got'em. Remember, take a knee. Troll Tebow. Chest bump. Hoke Point." Tackled. We'll see if this really is a repetition issue; it seems like it. With a new left guard, it may take time for Barnum to be able to quickly pick out his proper assignment. 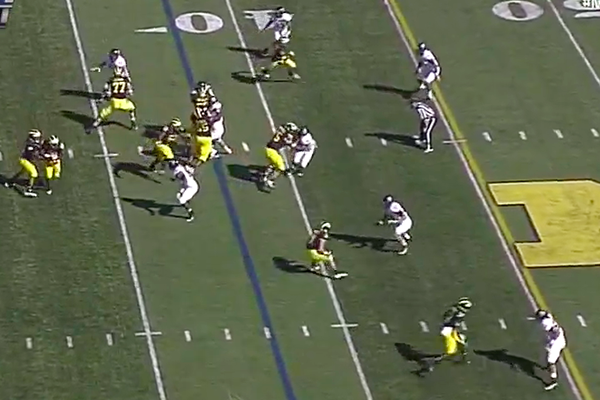 I'm just encouraged that Hoke and Borges have decided to actually option defenders.